ANVER divides small universal vacuum suction cups into three groups based on mounting specifications and style. 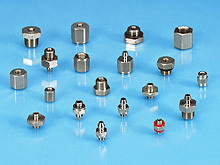 Group 1 Fittings, shown here, are simple barbed fittings that push in from the top of the cup. Within each vacuum fitting group, the hardware is interchangeable with all other suction cups within the group. Any Group 1 fitting will fit any Group 1 suction cup. It may also fit other suction cups with similarly sized holes in the cups’ centers. Contact ANVER to verify suitability. The suction cup is simply pressed onto the end of the barbed fitting to hold tight. Replacement takes only a few seconds and the fitting does not need to be unscrewed. 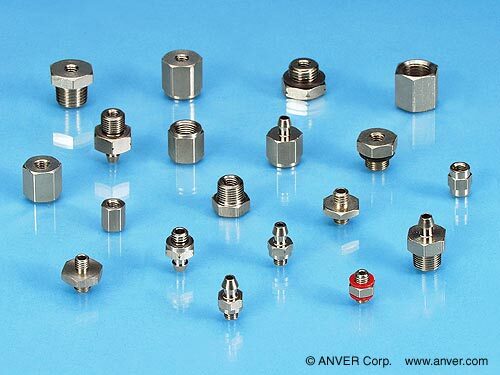 These specific cup fittings are top-quality production grade fittings made by ANVER Corp. in the USA. Note: 5 mm and 10-32 Male screws directly into 5 mm Female fittings.